Well, the sudden rise in temperatures certainly did a number on our back roads. I heard that there were ruts a foot deep in some places! Many folks had long walks over very muddy roads when they had to abandon their cars. It took some doing, but our road crew worked long and hard to make the roads passable within a day or so. Tom and I attended the YOH Theater production of The Three Musketeers on Friday evening, under the direction of Marcia Bender. Plymouth students Ian DuPont and Anna Hepler were among the talented cast in this hilarious play. Marvelous fencing, intricate dancing, and funny lines made it most enjoyable! I know that several folks in town also had a hand in lighting, set design and costumes. Nice job! Come celebrate St Patrick’s Day at the Reach Out Luncheon (jointly sponsored by Tyson Ladies Aid and Tyson Church) on Thursday, 3/17 in the Community Room of the church. For our listening pleasure, Adam Boyce will be joining us! I wanted to include a note of gratitude to the many people who responded to a medical emergency at Hawk a couple of weeks ago. The severe icing conditions caused an accident with injuries and getting to the scene without mishap was quite a feat. Emergency Services personnel, assisted by the Town road crew who spread sand, and the Sheriff all worked together to provide the needed assistance and made sure that the ambulance could safely navigate the road to get there. It is comforting to know that these folks are out there! We are gearing up for three special services at Tyson Church. This week is Palm Sunday and also Children’s Sunday, where we will have our youngsters playing “instruments” and waving palms. It should be quite an energetic gathering! 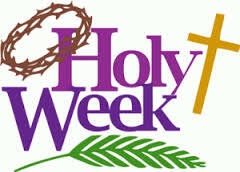 On 3/24 we will have our Maundy Thursday supper (6:00 PM) and service (7:00 PM). The meal will be simple – soup, along with veggie and fruit platters in our Community Room. Our service will take place in the sanctuary, where our time together and Scripture reading will be enhanced by wonderful drawings by Willow Bascom. The Lord’s Supper will be served. Everyone is invited to attend either or both events. This entry was posted in Community News and tagged Bethany Birches Camp, Easter, Holy Week, Reach Out Luncheon, St. Patrick's Day, Tyson Congregational Church, Tyson Ladies Aid. Bookmark the permalink.